A man who stole an unmarked police car after being caught riding a motorbike stolen from Fareham has been jailed for almost two years. Nathanual Hemy, 20, of Keynsham Road, Southampton, was sentenced to one year and ten months in jail at Southampton Crown Court today (November 21). Hemy had appeared in court yesterday (November 20) and pleaded guilty to charges of taking a motor vehicle without consent, aggravated vehicle taking, dangerous driving, driving whilst disqualified, assault and escape from lawful custody. The court heard that police officers in an unmarked car stopped a stolen motorcycle at the junction of West End Road and Chalk Hill, Southampton, at around 3pm on September 11. The motorcycle had been taken from an address in Fareham two days earlier. Hemy, who was riding the motorcycle, ran from the scene but was stopped shortly afterwards. The court heard that as he was being detained, Hemy evaded custody by driving the unmarked car away, dragging an officer along the road for a short distance. The male officer suffered grazes to his arms and knees and attended Southampton General Hospital for treatment. 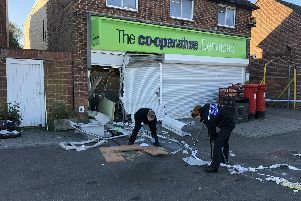 The unmarked car was recovered a short time later, having been driven dangerously through a residential area, the court heard. Hemy was arrested the following day. Following the hearing, Acting Superintendent Phil Lamb said: ‘Hemy’s actions that day were reckless and dangerous. ‘He put officers and members of the public at risk of serious harm simply in order to evade arrest. ‘It took up a significant amount of resources responding to this incident and in later detaining him.